Watch me make this homemade pancake syrup from start to finish! When it comes to pancake syrup my boys are SO DOGGONE PICKY!! I use to get whatever was on sale but not anymore. Now it HAS to be the Log Cabin brand or this homemade butter-maple pancake syrup recipe. KIDS! Thankfully, this pancake syrup has simple ingredients so it’s really nothing to whip up a batch if I find myself out of Log Cabin! I actually prefer homemade pancake syrup but sometimes the laziness gets the best of me. I grew up on nothing but from-scratch pancake syrup. I actually remember the first time I had store-bought pancake syrup. I went to my cousin’s house and they had Mrs. Butterworths. I thought that container was the best thing ever! However, the taste was just…ok. Sorta blah and flat compared to the rich, buttery, smooth goodness that I was used to. 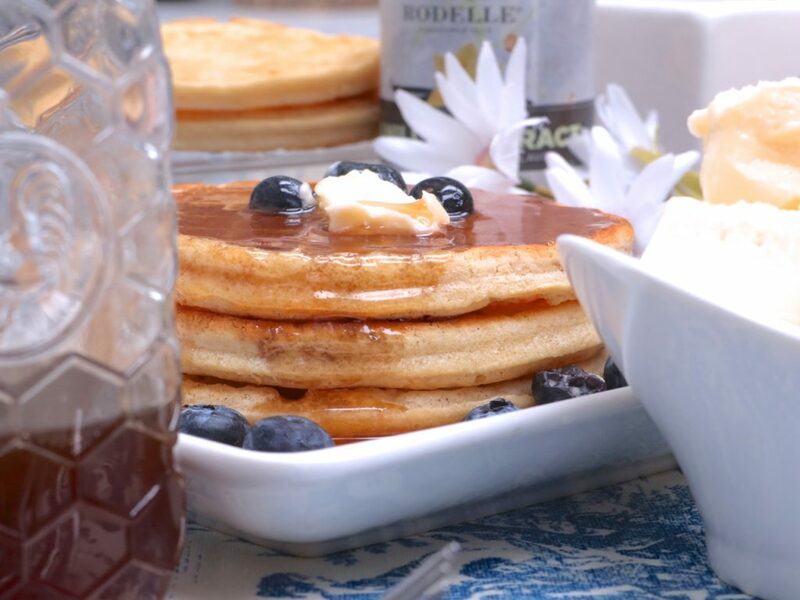 Have you ever had homemade pancake syrup? It’s really easy to get spoiled and not want anything else after you’ve had a good from-scratch pancake syrup. 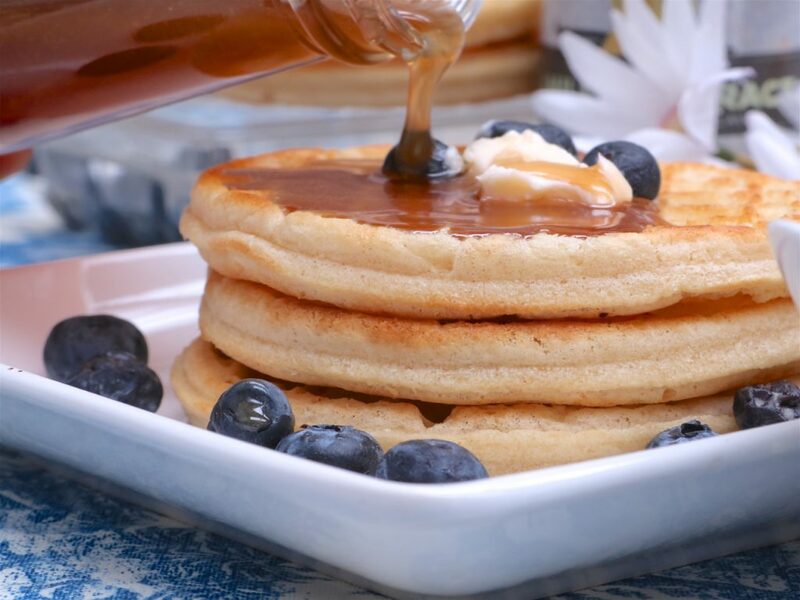 I adore this pancake syrup recipe. It’s very simular to the old-fashioned kind my grandmother makes only with the addition of brown sugar and more maple! 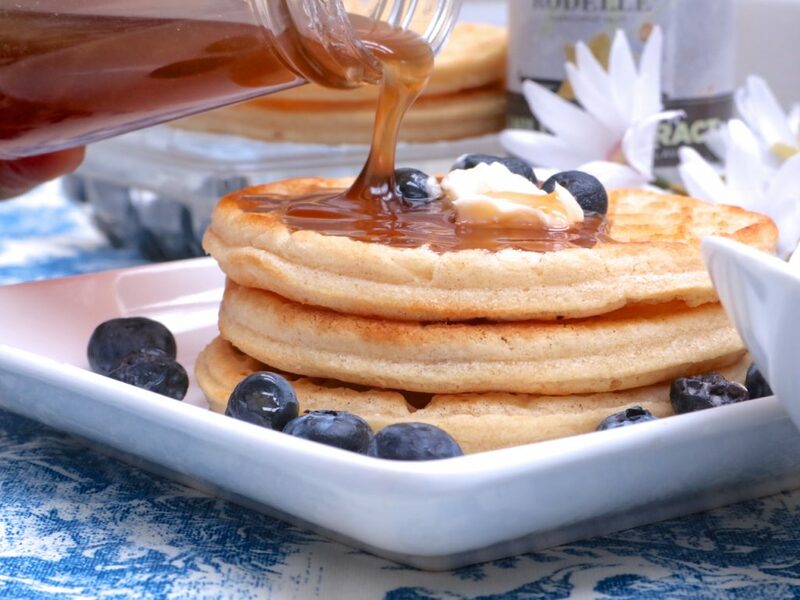 This syrup is so rich, smooth and with a slight creaminess to the texture thanks to the butter! 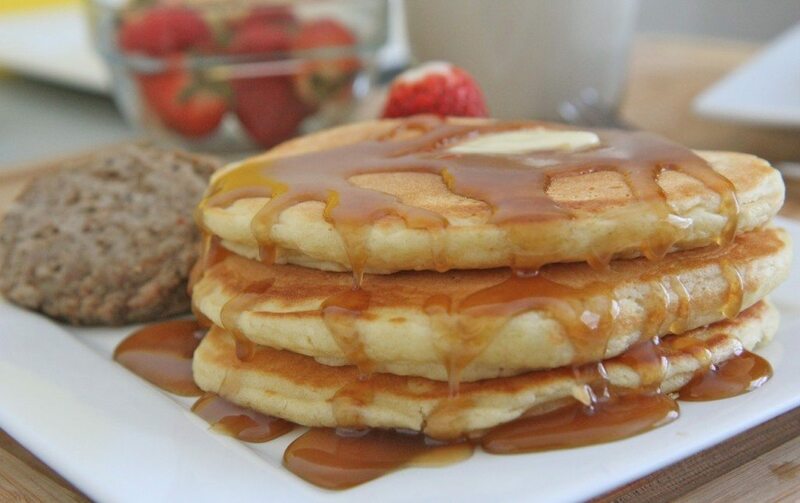 It’s amazing what butter does to this pancake syrup recipe! I’m using both vanilla and maple extract since I really like these to guys together. It’s really fun to play around with different extracts. Coconut extract is really good when served with banana pancakes. There’s no corn syrup in this recipe which means you’ll need to heat it up the next time you want to use it. That is if you don’t eat the entire batch in one sitting. Hey, we’ve done that plenty of times! That’s just how delicious this syrup is! I hope that you enjoy this tried and true, old-fashioned pancake syrup recipe just as much as we do in my house! In a nonstick pot, over medium heat, stir together water, brown sugar, and white sugar. Bring to a simmer and stir in cream of tartar and salt. Once thickened, remove from heat and stir in butter. Once butter has melted stir in vanilla extract and maple extract. Pour syrup into a serving dish. Let syrup cool slightly, which will allow it to thicken up even more. Looking for something to use with this pancake syrup? Just made the pancakes and syrup. 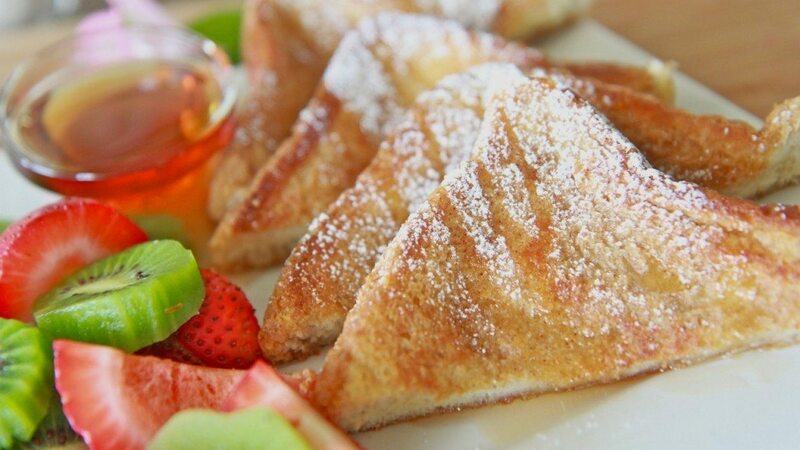 ?.OMG we loved it, so yummy I will never buy store syrup again. I love that the pancake batter is thick and not runny, make the best pancakes. We used my own buttermilk reserved from our home made butter . Thanks for all yours wonderful recipes. 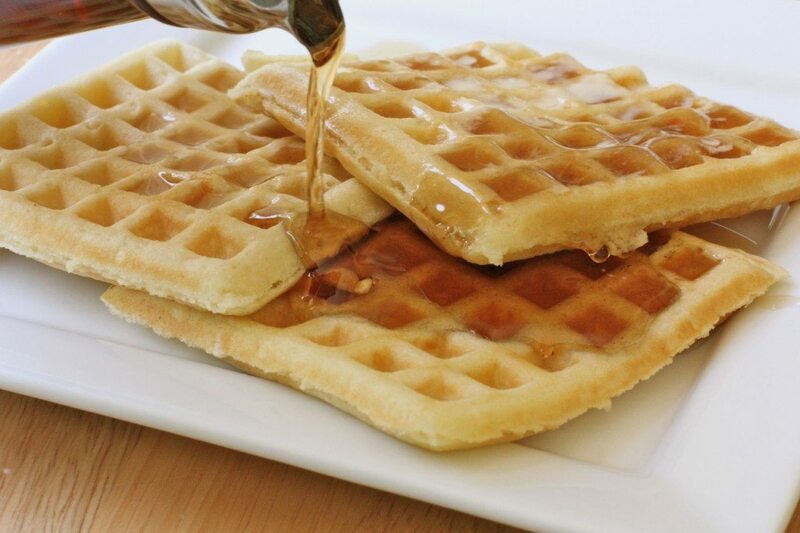 Instead of maple syrup can I add Treacle Monique?